A Notice Of Leave To All African Migrants In Israel, News Reaching Us From The BBC News, Reports That The Israeli government has issued a notice leave to thousands of African migrants In Israel to leave the country or face imprisonment Come April 2018. They will be given the option of going to their country home or best go to another third countries. The Israel Authority Said, Here In quote ”If they do not leave”, the Israeli authorities will start jailing them from April 2018. According to the UN refugee agency, the controversial plan by Israel Authority to African Migrants To Leave violated international and Israeli laws. Israel’s unwanted African migrants, The Israeli government says their return will be humane and “voluntary” if they do note leave. A spokesperson for Israel’s Population and Immigration Authority told the BBC NEWS And Other Media Houses That there were currently 38,000 “infiltrators” in Israel, of whom just 1,420 were being held in detention facilities. 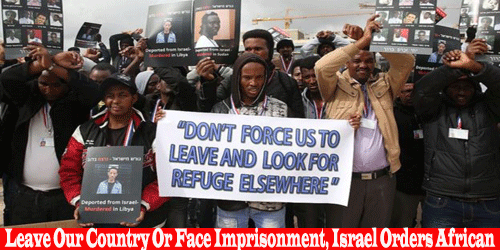 0 responses on "Leave Our Country Or Face Imprisonment, Israel Orders African"